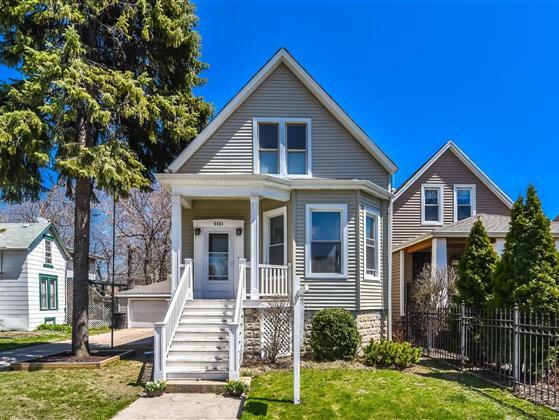 Absolutely Stunning 4 Bed, 2.5 Bath 2 Story Home w/ a 2 Car Detached Garage & HUGE Fenced-in Backyard in an Excellent Location nearby Shopping, Dining, Schools, Parks & Public Transportation! A Hop & Skip away from Mayfair Park! Easy Access to I-90 & I-94. This Spacious & Unique Home has everything you need. NEW roof, siding, plumbing, & electrical. Hardwood flooring under laminate floors. Living/Dining Combo w/ Large Windows, Built-Ins & Trey Ceiling. Eat-In Kitchen w/ 42” Cabinets, Solid Surface C-tops, Black Appliances, & Pantry. Enclosed 3 seasons Porch/Mudroom off Kitchen. 2 Beds & Full Bath on Main Level. Head upstairs to the Master Retreat w/ Cathedral Ceilings, Skylights, Stained Glass, Ceiling Fan, Walk-In Closet & Private Office. Add’l Bed & Updated Bath w/ Amazing Walk-In Shower, Vaulted Ceiling & Skylights! Laundry Room, Rec Room, Workshop, & 1/2 Bath in Basement! In ground sprinkler system! You won’t find another property like this in the city. Don't miss out!